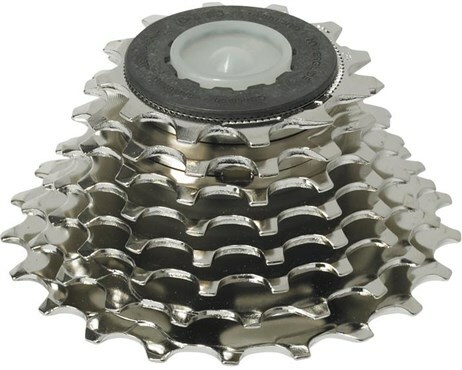 The Shimano HG50 8 speed road cassette is a worthy upgrade for your bike. This high-quality 8-speed cassette comes with close ratio gearing for finer cadence control. A nickel-plated finish ensures you’ll be using this Shimano upgrade for a long time to come. Had this for about four months now and still working like new and I have used it loads. Easy to fit. Had 3 long rides over mountains and flats and absolutely no complaints. This is a quality product, as to be expected from shimano and does the job perfectly, no need for all these expensive new high tech products. Good product. Good price. Good delivery. Will use tredz again. Bought 11-28 with new chain to replace standard 12-25 cassette and already feeling benefits on the road. Gear changes seem smoother even without changing shifters or derailleur mechs! Bought this to replace the standard 13-26 cassette on my 2012 Specialised Allez, along with a WH-RS21 rear wheel. After 60 miles, the combination works very well, and I am particularly pleased with the wider range of gears. I had anticipated problems with adjustment, but it's absolutely fine. My only gripe is that I needed to fit a spacer which was not supplied and not mentioned in the on-line manual. A spacer was supplied, but documentation suggested it was not necessary for the 8 speed cassette, and it was thicker than required. Sorted by LBS. Very pleased. Brought this to upgrade my gears works well really smooth and well made.